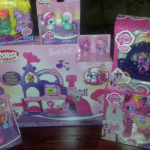 Hasbro brings a new exciting segment in My Little Pony to children as young as 18 months. 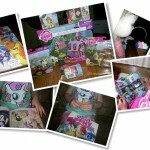 Now your growing toddler can discover the fun of My Little Pony with Playskool Friends My Little Pony toys. 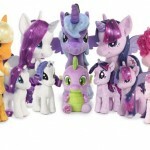 The perfect size for little hands to hold, these colorful, age-appropriate pony friends feature beloved characters such as Rainbow Dash, Rarity, and Applejack. Each Friendship My Little Pony two pack makes the perfect stocking stuffe. 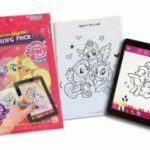 Each pack includes a pair of adorable, toddler-friendly My Little Pony Charters. Choose from AppleJack and Daisy Dreams, RainbowDash and BumbleSweet or Minty and Moon Dancer. The figures work with other Playskool Friends play-sets and vehicles. 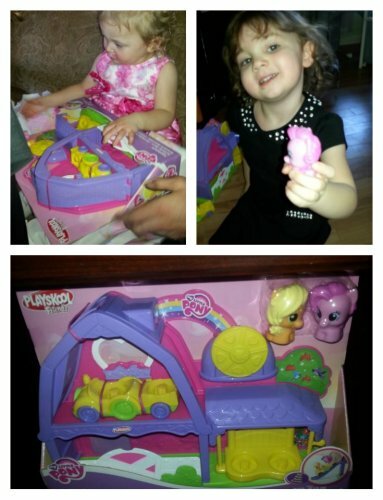 New for 2016 comes Playskool Applejack Activity Barn. This playset comes with chunky Pinkie Pie and Applejack figures that can ride around in the tractor or swing together on the swing. There’s a ramp that takes the tractor up or down, and the barn’s gate folds down. 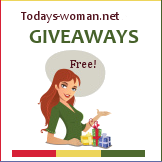 Spin the wheel to hear clicking sounds. Everything on this playset is easy for my niece’s small hands to play with and engages her in imaginative play. While the Playskool Friends My Little Pony toys may be geared at a younger audience, my daughter who is just shy of three enjoys playing with the line with her younger cousin. This playset and its figures are compatible with other Playskool Friends My Little Pony sets and figures, sold separately. 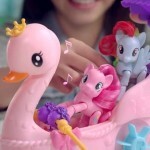 With the Playskool Friends My Little Pony Musical Celebration Castle, toddlers can engage with the ponies of Equestria. 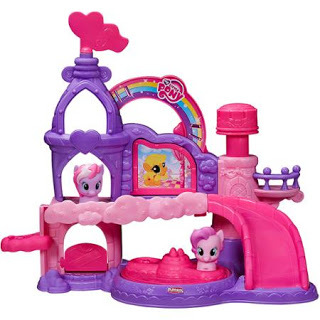 The castle play-set comes with two chunky pony figures- Pinkie Pie and Starsong. Place the ponies on the dance floor and press the large button to make the dance floor spin while music plays. For more sounds, flip down the Applejack pony panel. The play-set also features a kid-powered elevator, a slide, and an opening stable door. When the pony friends are ready for nap-time, flip down the wall on the second floor to reveal a comfy bed and hear lullaby music. 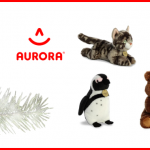 Note: This play-set requires two AA batteries. Make sure that you have some on hand Christmas morning. 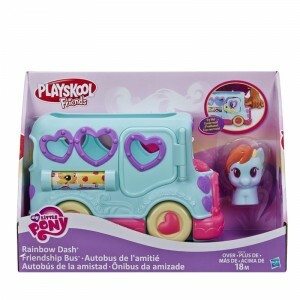 This colorful My Little Pony bus comes with a Rainbow Dash figure, which you can also use in the Playskool Friends My Little Pony Musical Celebration Castle or in the Playskool Applejack Activity Barn. There’s also room on the bus for two more ponies. The bus measures 7.5-inches long and has some fun features for little ones to enjoy. Aside from working wheels, there is a roller on the side of the bus for kids to spin to see images of popular ponies, Pinkie Pie and Apple Jack. There’s a Rainbow Dash stop sign to open and close, and a button on the hood, that kids press to open the bus door. Tell us about your my little pony obsession. I just love My Little Pony. My sister had tons of them when she was little and I’m so glad that they have made such a strong comeback. I love the play sets here.